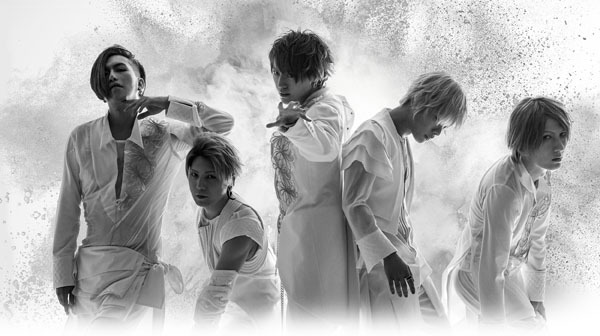 A9 is back after a year of hiatus and they started it with an anniversary live followed by a 2015 Tour Re:birth –Tensyou- which includes various stops within Asia, such as South Korea, China, Taipei, Hong Kong, Malaysia and Singapore. 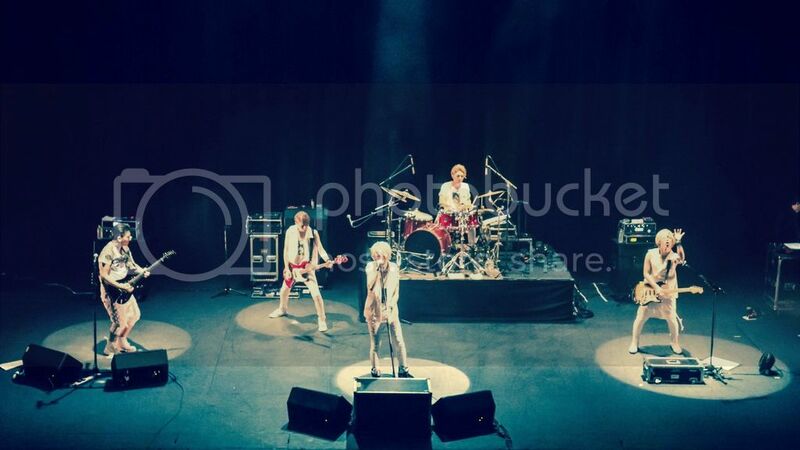 The band received tremendous support from Singapore the previous time that the concert was released as a DVD. This year, the band is performing in Singapore for 2 shows, which allowed fans to enjoy their performances double the time and also gaining more people to attend their shows. 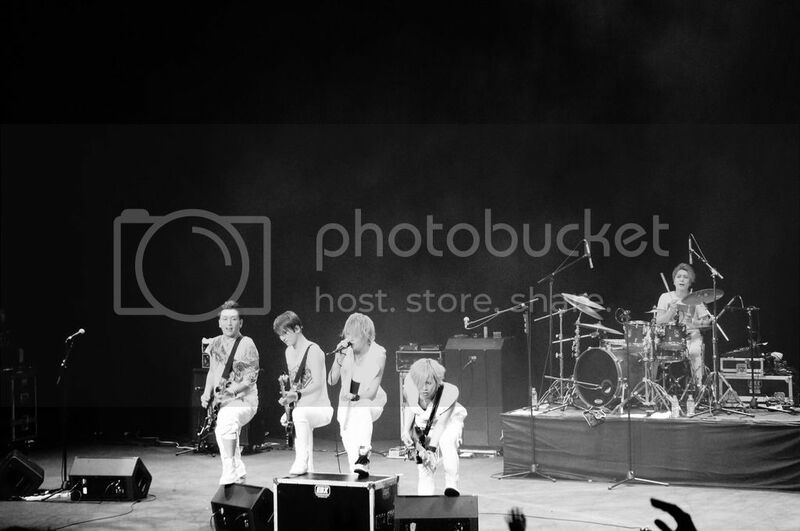 The members all wore white which symbolize the tour theme; re-birth. The show started off with an instrumental session. White pen lights moved in beat as songs like Phoenix and Heart of Gold brought up the atmosphere in the whole theatre with clapping and shouting from the crowd. Guitarists, Tora and Hiroto charmed the crowd with their skillful high notes solo and smooth transition between them in Doukeshi. Whereas bassist, Saga gained a lot of screams from the crowd in his solo in Judan and the crowd head banged in sync with the members during the interlude of the song. The show was brought to an even higher atmosphere as Hana and Blue Planet started playing with the whole crowd jumped throughout the whole song. 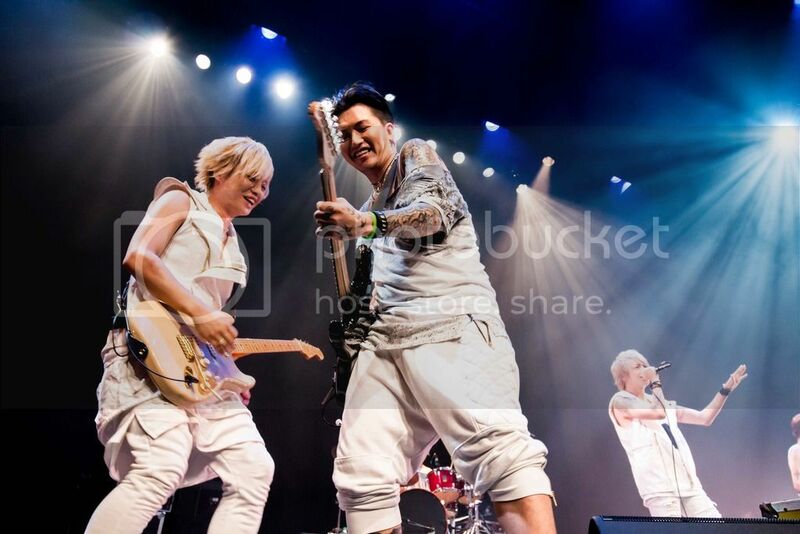 Guitarists, Tora and Hiroto shared a playful moment which got the crowd screaming in respond. The cheerful atmosphere continued as the band performed Ryuuseigun where the crowd and band members swing their towels and pen lights in unison. Vocalist, Shou displayed his powerful vocals and vibrato in mid-tempo song such as Shooting Star. 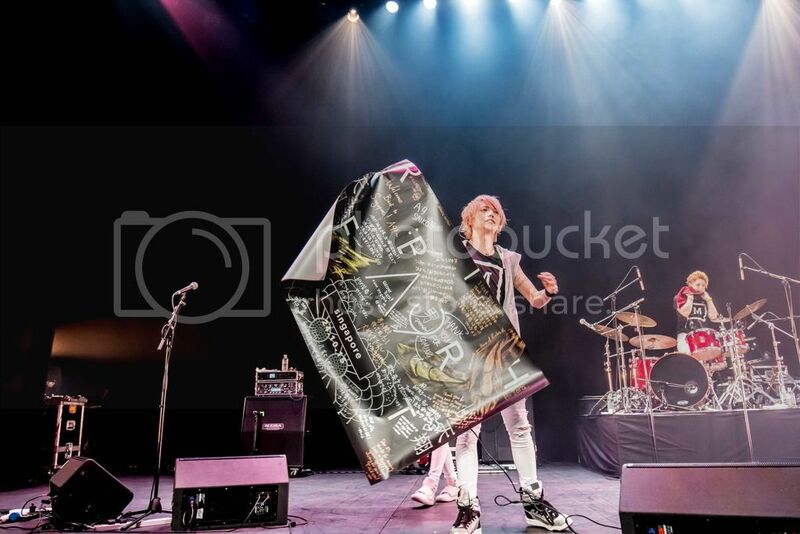 An exclusive duet performance of Freesia no Saku Basho and SHADOWPLAY between Shou and Hiroto captured the audiences’ heart as the guitar notes accompanied Shou’s vocal beautifully and with good balance. 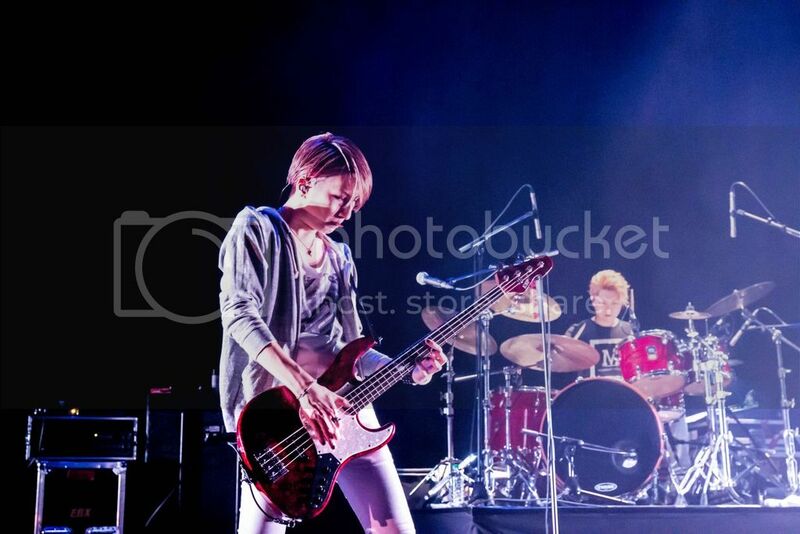 The show progressed to the instrumental solos with a session by Hiroto and Tora. Accompanied with low sturdy beats from the bass drum, the session was filled with a mysterious feel which had no doubt capture the full attention of the audience. The crowd cheered as the tempo rose with skilled technique of fast notes from the guitarists. The band had a little break in between with drummer, Nao introducing the concert merchandise goods by cutely shouting “Buy my goods home!” and “Buy more!” He also threw in a few words of Singlish which had the crowd roared in laughter. Despite the small little break, the theatre atmosphere was once again brought up with songs like RAINBOWS, SHINING and Shunkashuutou. The climax reached as the last song TSUBASA.started playing. The crowd jumped higher and in joy, enjoying the beat together as one. After a short wait of encore call, bassist Saga and drummer Nao came back on stage with a session together and was presented two pink bras from the fans. The two instruments harmonized splendidly together with their low mellow notes. The rest of the members joined in back for a powerful fast paced High Collar Naru Rondo which displayed each members’ talent in their own instruments with their own solo part in the song. All of them had fun interacting with the crowd and had their own fun time by teasing the other members with the bras they received. The whole show wrapped up with the last song, the beautiful name. Both the band members and the audience were indulged in the same ambience as everyone were singing and swaying together. The band finally bid their goodbye to the crowd and presented them with picks and drum sticks. 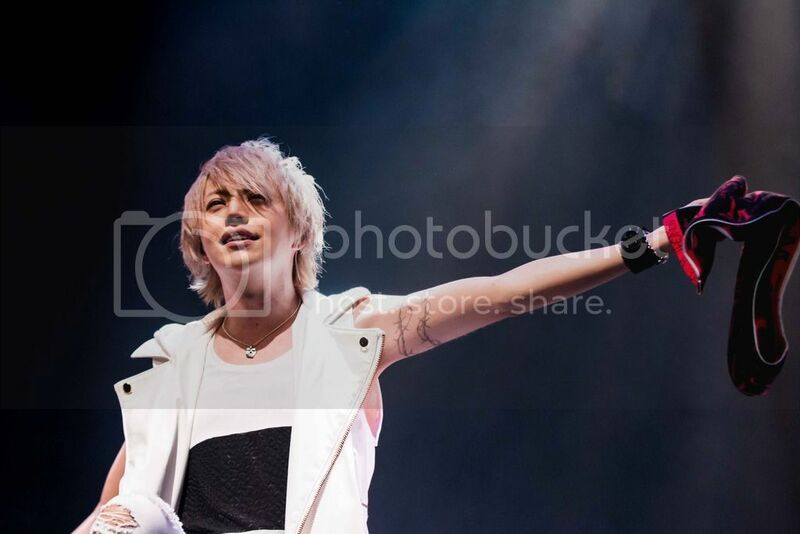 Hiroto who was reading his English message from his wrist and expressed that they would come back and hope the fans wait for them in the future. As the tour theme “re:birth” goes, we would be expecting to see more growth from A9 in the future after this comeback! Let’s continue to give them the support for their future activities and we hope to see them again for another superb concert!